Need to ship a painting you have just sold to your client? Moving to a new home? Looking for the safest way to relocate your priceless collection for temporary storage while renovation works take place? Whatever the reason, you have come to the right place as in this blog post, we are going to discuss the best way to ship a painting! There are so many reasons to move or ship a painting, but the task is always the same: you need to protect your valuable artwork and ensure that it arrives at the destination intact. Moreover, this applies not only to very expensive paintings or works by famous artists but also to your family heirlooms and other pieces that have sentimental value for you. 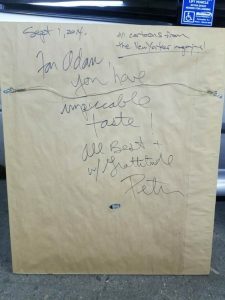 Being a professional fine art shipping company in NYC, we frequently deal with paintings of any type and know how important they are for the owners. Your desire to protect the artwork is completely understandable, especially taking into account all those risks that can lead to damage during transit, including impacts, breakages, smudges, and tears. So what is the best way to ship a painting safely? Whether you are shipping a painting by Picasso or your priceless family heirloom, the first thing you should do is properly pack it and prepare for the transportation process. This is especially true if your artwork is framed with glass that can break and damage the surface of the painting if something goes wrong in transit. To avoid this, use special blue tape to protect the glass and only then wrap your painting with bubble wrap or another packing material. 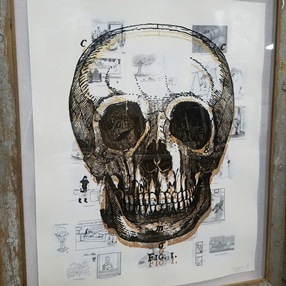 Besides, you can also use two sheets of rigid cardboard matching the dimensions of the frame to provide even greater protection to the artwork. However, if you want to ship a painting in the safest way possible, standard soft packing is not enough. You need a sturdy wooden crate built specifically for your artwork. 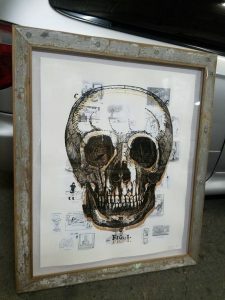 This is particularly true if you are shipping a valuable piece framed with glass like this beautiful painting of a skull we packed and shipped for our client. Finally, to ship a painting safely means to hire a reliable team of fine art moving professionals like Fine Art Shippers. We will provide your treasured piece of art with the protection it deserves and ensure that it arrives at the destination in its pristine condition. Besides, if you request a free shipping quote now, you will see that our services are not only professional but also affordable!